Preheat oven to 200C and line a flat, rimmed baking tray with greaseproof paper. In a small bowl, combine the chickpeas, olive oil, spices, and a pinch of salt and freshly cracked black pepper and toss to coat evenly. Transfer to the lined baking tray and place in the oven to roast for 30-40 minutes, or until crunchy. Toss the chickpeas every 10 minutes to ensure even cooking. Remove from the oven and allow to cool. Heat oil in a large saucepan over a medium heat. Add onions and sauté, without colouring until soft and translucent, approximately 6-7 minutes. Add in garlic and cook for a further 1-2 minutes. Stir in the tomato paste to coat onion and garlic before adding paprika, coriander, KEEN’s chilli powder and cumin. Pour in the tinned tomatoes, vegetable stock and piquillo peppers, stir to combine. Break up the tomatoes using a wooden spoon. Season with paprika and a generous pinch of salt and freshly cracked black pepper and bring to a boil. Reduce the heat to low and simmer for 10 minutes. Use a stick blender to blitz the soup until smooth. Taste and adjust seasoning if required. 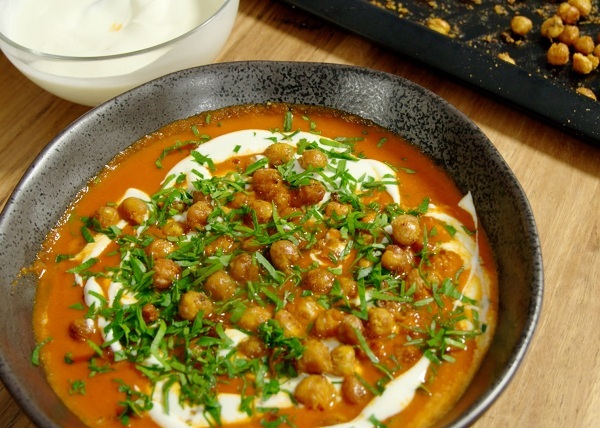 Divide soup into serving bowls, top with a dollop of Greek yoghurt, freshly chopped parsley and a generous sprinkle of spiced chickpeas.